Designing a new shower? Replacing a head? Overhauling a bathroom? No matter the size of your project, it’s important to educate yourself before you start. Choosing a new shower head may seem straightforward, but in reality it can be a much bigger decision than you realize (and you’ll realize it when you take your first shower and regret your uninformed purchase!). First, you’ll need to decide where you’ll be mounting your shower head. A shower head can be mounted on the ceiling or on the wall. If you’re working with existing plumbing, then this decision is already made for you. Otherwise, the choice is a personal one and depends on the type of shower head you’d like. You’ll also need to decide how far you want and need the shower head to project from the wall or ceiling. Consider the height of shower user(s) before choosing and installing; measure the shower to ensure that the height and angle of the shower will work. If you want a ceiling mount on a low ceiling, pick one that is as close to flush as possible. Check that the size, height and projection will be comfortable for shower-takers – you shouldn’t have to bend down and should be able to easily reach the head for adjustments if necessary. 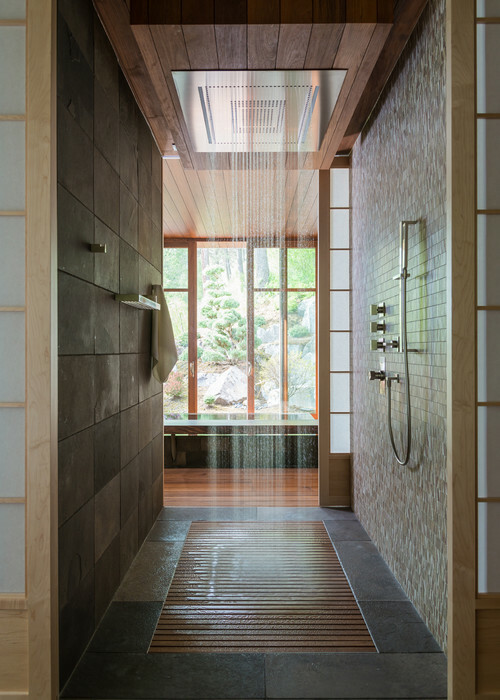 If you prefer a rain shower, it should ideally be ceiling-mounted; a recessed head must be ceiling-mounted, while a regular rain shower may be wall-mounted if the height of the shower allows for it. A wall-mounted rain shower will likely need an extension arm so that the head can be flat and “rain” straight down rather than on an angle. Next, think about the shape of your shower head. This is a mostly aesthetic decision, but practically speaking you should consider the space constraints and your desired spray area when choosing a shape. An unusually-shaped or decorative shower heads can be a statement piece and provide a unique shower experience. Generally speaking, bigger is better when it comes to shower heads. A larger area means that more of your body can be in the spray at the same time. If you like a more concentrated, intensely massaging stream, choose a smaller head. Shower flow is measured in gallons per minute (gpm). The maximum flow rate on shower heads is typically 2.5 gpm. It’s important to know the flow rate of your shower head in areas where water pressure is regulated, like California, and in homes with low water pressure. Aerated shower heads are often recommended for homes with low water pressure as they boost pressure without using more water, but they can result in colder water; if possible, invest in a special low flow shower head for best results. Decide what kind of spray pattern you prefer. Patterns include rain, mist, aerated spray, jet, pulsating, and waterfall, among others. The spray can be firm and invigorating or soft and gentle. If you’re the only one using the shower and you have a strong preference for a spray type, you can pick a shower head with the pattern that you like. Otherwise, choose a multifunction head; it’s good for multiple users and for the days that you decide you want a different type of shower. Some heads can change pattern with a simple twist of the face; others are operated by moving, flipping, adjusting or otherwise operating the head. The Cura rain shower by Aquabrass offers five varied spray patterns to please every member of the family. The humble shower head can be elevated to a spa-worthy fitting with chromatherapy (colored lights), aromatherapy (scents), and/or LED lighting to indicate temperature. Pick features to change a simple shower to a relaxing and luxurious experience. Want to go beyond the shower head? Upgrade your shower with a full shower system, body sprays, shower panel or shower pipe for true luxury. What’s in your dream shower? Special thanks to our dedicated salesman Dov for his advice in compiling this guide. Thanks again, Dov! These bathroom fixtures are really awesome.I should use this type designs for my bathroom. Shower heads are what I actually love to buy because being in the bathroom is the best part of my day. Having a good shower head will stimulate you to be more relaxed. Thnx for useful information! Choosing a shower head is a real trouble as for me. I was looking for the best one for a long time. Hope, it’ll also help anybody who still doubts which one to choose. Good luck!